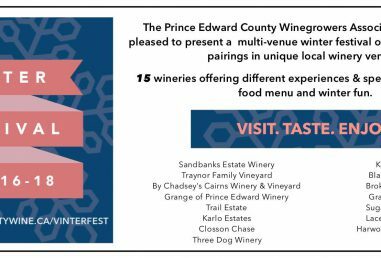 Prince Edward County Winegrowers Association presents their second annual multi-venue wine and winter festival – Vinterfest – over Family Day weekend, February 16-18. Prince Edward County, ON – Prince Edward County Winegrowers Association (PECWA) is pleased to present a multi-venue winter festival of fun, food and wine pairings in unique local winery venues. The “Vinter Festival” (a play on the words vintner and winter) will run from February 16 – February 18, 2018, over the Family Day long-weekend. 15 wineries offering tastings, many of which will be unique to the weekend’s celebration and in collaboration with a food menu and winter activity. Enjoy authentic Caribbean cuisine from Chicos Caribbean with pairing wine flights at Lacey Estates or at Harwood Estate Vineyards with a signature citrus infused White Sangria. Join in a tutored four course pairing of Caribbean inspired food from Guapos Cantina paired with Reserve wines at Sandbanks Winery or enjoy their red hot chocolate by the outdoor fire. By Chadsey’s Cairns will host cheese and chocolate fondue daily between 2pm – 4pm paired with their Muscat 2017 wine and mulled wine with lavender flowers and mulberries. At Sugarbush Vineyards you can grab a chilli or curry bowl, a warm refreshment and snuggle up by the bonfire or head out on a winter walk with snowshoes. You will also find bonfires and snowshoeing trails at Three Dog Winery where you can also enjoy their famous maple cones (vegetarian option as well) while listening to live musical performances by a local family favourite, Andy Forgie. Hothouse Mobile Sauna and Lounge will be on-site Sunday, February 17th. Both Saturday and Sunday you can kick off Vinterfest with a hot, icewine-drenched French toast, fresh fruit, maple cream brunch at Trail Estate Winery 10:30am – 3pm, or register for a Winemaker’s Cellar Tasting, 12pm, 2pm and 3:30pm. Taste wines in progress direct from the barrel and compare to their finished siblings. RSVP required. Keint-he Winery and Gravel Hill Vineyards will be offering hot drinks and winter activities. Visit the baby doll sheep at Gravel Hill and Broken Stone Winery or participate in a wine barrel hockey shoot-out at Keint-he. Unique to Black Prince Winery, stop in to view barrel toasting demonstrations out back or enjoy a hot vin-cider at the bar, or in the barn. Grange of Prince Edward Winery will be participating in the history themed Flashback February series in The County by hosting an antique cookbook roadshow featuring Liz Driver, food historian, cookbook expert and South Marysburgh resident. You may even have a chance to sample a taste of history with recipes from Dora’s Cookbook published in 1888. Karlo Estates will be hosting their annual and highly anticipated Ski-doo Snow Bunny Dance Party with DJ Ombudsman among other featured activities as well as specialty wines and a hearty food tasting or meal menu. Hothouse Mobile Sauna and Lounge, will be on-site Saturday, February 16th. Visit hothousesauna.ca/about for tips, and info on sauna etiquette. At Closson Chase Vineyards enjoy some homemade shrimp & sausage jambalaya paired with two Pinot Noir tastings for $10. From there head to Traynor Vineyard for a little chocolate fix from the Centre and Main Chocolate Pop Up or roast a hot dog or marshmallow on the outdoor fire. Traynor will also feature a special 5 wine tastings with Italian chicken, quinoa, veggie soup for $12. All participating wineries are open throughout the long weekend, Saturday through Monday for regular business. Open hours will vary between individual wineries. Specials and exclusive wines will be highlighted and available for tasting at the participating wineries. Go to facebook.com/vinterfestpec to follow up the latests news and features.